I was watching Barney Miller this morning, as is habit. And yes, I am aware it is no longer 1978. Whatever. My AM routine includes the local news, a cup of coffee, and an episode of the aforementioned sitcom featuring the antics of the men (and occasional women) of the 12th Precinct. Thank you, Antenna TV, for your perpetual reruns of this great show. Today’s episode made me laugh out loud. Wojo, Dietrich, and Yemana were marveling over “a phone without wires!” They thought it was the coolest thing ever, and couldn’t believe how advanced technology had become. Here they are, fawning over this thoroughly modern 20th-century engineering feat. You think that’s something? Just wait, fellas. And by the way, is this thing even real? Did such technology exist in the 70s? This is a regular ol’ telephone, minus the cord, with an antenna attached. And they were walking around the police station using it to make calls. According to my research (and by that I mean reading the “history of mobile phones” Wikipedia page), while the technology dates back to 1946, the first true handheld mobile phone was produced in 1973 and looked like the so-called “brick” we have all seen and laughed at in old photographs and movies. Hell, I was just joking about these primitive phones in my last post. 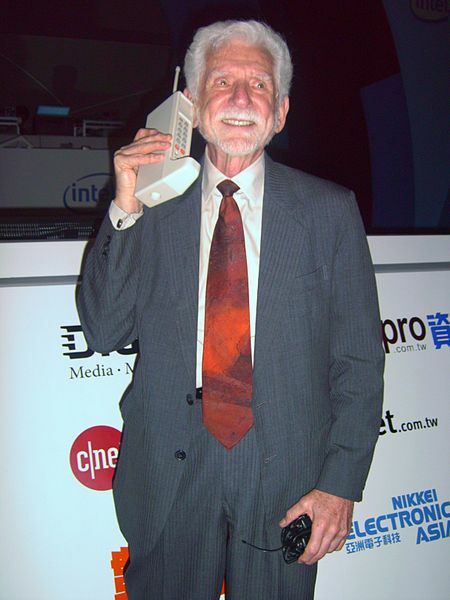 Martin Cooper showing off the first handheld mobile phone, released in 1973. 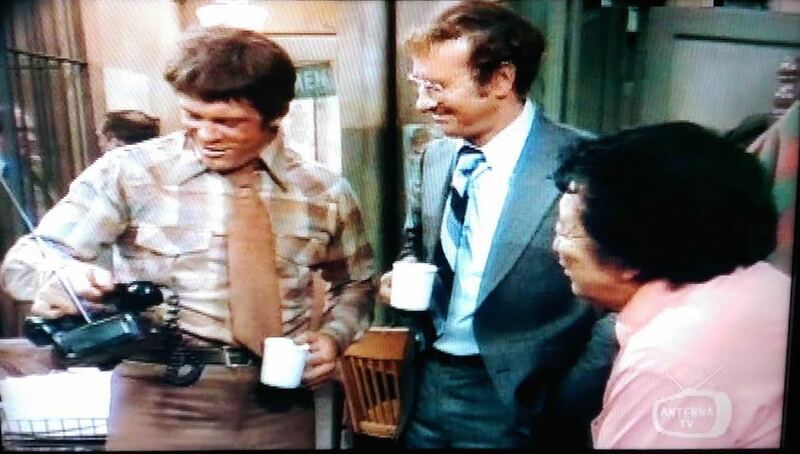 Which leads me to Conclusion A: Barney Miller took creative liberties with the whole “wireless phone” thing. Sure, they had existed for a few years by the time this episode originally aired, but I doubt anybody had ever actually seen one. And that leads inevitably to Conclusion B: Barney Miller was ahead of its time. This got me thinking about other television shows that were ahead of their time, for one reason or another. These are not necessarily critically acclaimed shows that never found an audience (Pushing Daisies, Arrested Development) and may, in fact, have had long and successful runs – they just did things differently, or did them first. In addition to Barney Miller, which makes my list not just because of the futuristic look at mobile communications but also due to its forward-thinking, realistic depictions of homosexual relationships, I offer you the following (in no particular order). Star Trek. In 1968, this sci-fi classic boldly went where no man had before, at least on primetime television, and broke the color barrier by featuring an interracial kiss between Captain Kirk and Uhura. Despite occasional missteps (tribbles, anyone? ), the franchise continues to live long and prosper. My So-Called Life. This short-lived drama became a cult classic and launched the careers of Claire Danes and Jared Leto. Though its main characters were high school students – nothing original there – their daily struggles with realistic hot-button social issues of the day were far more realistic than those experienced by their peers in the 90210 zip code who were more concerned with saving The Peach Pit. Seinfeld. No other show spotlighted the flaws and idiosyncrasies of its main characters so perfectly. It succeeded in making a group of whiny, apathetic, self-absorbed New Yorkers likable, no small feat. Let’s not forget all the great catchphrases (yada-yada, spongeworthy, master of your domain). But the most compelling reason for being ahead of its time: in one episode, Elaine is dating a guy with the same name as a serial killer. She is flipping through Sports Illustrated and suggests he change his name to O.J. This episode aired seven months before Nicole Simpson was murdered. Lost. Love it or loathe it, odds are you talked about it (and those conversations inevitably contained the phrase “WTF?!”). This head-scratcher heaped layer upon layer of unresolved mystery upon you and the whole thing was a mishmash of unconventional plots that included time travel, flashbacks, flash-forwards, obscure references to 18th-century philosophers, and polar bears on desert islands. It never made much sense and the finale was infuriatingly dense, but it was completely original and strangely engrossing. Networks are still trying to come up with the next Lost, years after it went off the air. That’s my list! What television shows would you consider groundbreaking or ahead of their time? OMG Mark, yes, I remember those HUGE ‘brick’ cell phones when they first came out. I also remember the cell phones you could use in your car that were plugged into the cigarette light. My boss had one and I thought it was so cool. I think the Hanna-Barbera cartoon, The Jetsons, was WAY ahead of its time. The Jetsons had microwave ovens, electric toothbrushes, moving sidewalks, automatic doors; all of which actually came to be. It’s almost like they could SEE into the future! Ron, both shows you mentioned were contenders for my list. The Jetsons perfectly foretold the future, and All in the Family basically invented the anti-hero in Archie Bunker. It might still make the cut today; have you seen some of the shows airing currently? Seinfeld was the best.show.ever. Sooo ahead of its time. Do you follow any of thoe modern Seinfeld Twitter accounts? So funny! I think The Real World was ahead of its time. It was the first reality show (or at least most visible one) that ushered in decades of reality. Love it or hate it, it’s here to stay. I do not follow the Seinfeld Twitter accounts, but that’s only because I never log in to Twitter. The Real World also almost made the cut, because I agree with you: for better or for worse, it basically invented the reality TV genre. And my vote comes rolling in for…Dr. Quinn Medicine Woman! That’s right, you heard me. The TV drama about a Boston woman doctor paving her way in the wild wild west, defying the patriarchy, raising 3 orphan children, and all while wearing a prairie skirt and a bun. BOOM! Oh, Jess. LOL. Can’t say I’ve ever seen it. But the way you describe it, I’d have to agree that it does sound pretty backbreaking! Would Matlock also make the cut for you? I’m gonna vote for The Monkees. No particular reason, except that I think perhaps Mike Nesmith and his wool hat was one of the first hipsters. Ha. But weren’t The Monkees simply a ripoff of The Beatles? Then again, they didn’t have a TV show (unless you count the cartoon), so I suppose we do have to give The Monkees credit for this win. I’m still waiting for it to be acceptable to fly around in our underwear in our invisible plane. I loved Barney Miller, Taxi, and Maude (does anyone remember Maude). That was the best TV. You can fly around in your underwear if you want, but be prepared for an interrogation once you land. I never saw Maude, but I know it launched the career of Bea Arthur, who went on to become one of the Golden Girls. So I’ll give you a point for that suggestion. Loved Taxi, too. Lost was a favorite show for me but you know what, I never finished it! I might need to start from the beginning again and try to get through it. That always seemed to happen with me when i tried to watch a show that had not yet completed. Wojo cannot take a selfie. I loved watching Barney Miller, truly a class sitcom with great acting and superior writing. Never can get enough jokes about Yemana’s lousy coffee.